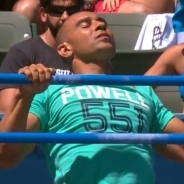 Out of Will Powell’s five CrossFit Games masters appearances, he has won three. After taking fourth in his debut appearance in the 2013 Reebok CrossFit Games Masters Men 50-54 Division, he took first the next year in the same division before winning back-to-back victories in the 55-59 Division in 2015 and 2016. Powell also won the Masters Qualifier in 2015 and 2016, winning all three stages—Open, Qualifier and the Games—in 2016. In 2017 Powell competed with a cantaloupe sized benign tumor on his left lung. With less than half lung capacity in that lung he pulled out a 12th place finish. He returned home to have the tumor removed three days later. He has spent most of 2018 working his way back to top shape. A former D1 collegiate track-and-field athlete, Powell started CrossFit in 2012 and is also a professional bodybuilder.